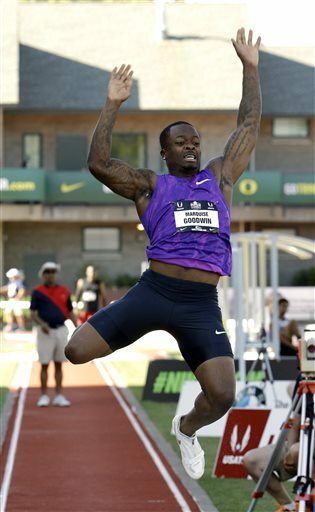 Bills WR Marquise Goodwin took a shot Thursday at qualifying for the US National track and field team for the World Championships in Beijing next month. He was trying to land a spot on the team as a long jumper. Goodwin had to finish among the top three to make the team and appear in the World Championships. The Bills receiver finished fourth with a long jump best of 27-feet 5 1/2-inches. Goodwin admitted that had he qualified for the US team, balancing the World Championships in China and training camp, which overlapped would’ve been difficult. But that’s no longer a concern. The Bills receiver qualified for the 2012 US Olympic team, but finished a disappointing 10th in the 2012 London games. Goodwin didn’t rule out trying to qualify for the 2016 Olympic team which will compete in Rio next summer.